LAS VEGAS (AP) — O.J. Simpson, a former star athlete who once lived for the spotlight, was back on stage telling the grim story of the Las Vegas afternoon in 2007 that sent him to prison. No longer the glamorous celebrity in an expensive suit, Simpson wore a drab prison uniform during Wednesday's court appearance. But he ignored the impediments of leg shackles and handcuffs, settled back in the witness chair and talked his heart out for five hours trying to convince a judge he had been wrongly convicted. When he left the stand, he sighed and appeared relieved. His lawyer, Patricia Palm, said, "He was happy he got to tell what happened." Simpson seemed to describe every minute of a weekend that was seared in his memory. It began with plans for a friend's wedding and ended with him under arrest. Palm said she would have but one more witness to call on Thursday. Malcom LaVergne, a lawyer who handled part of Simpson's earlier appeal, was expected to discuss the relationship between the football Hall of Fame star and his Florida lawyer, Yale Galanter. Simpson told of meeting LaVergne after he was convicted and feeling the appellate lawyer had a firmer grip on his case than Galanter, who was preparing the appeal. "I really felt that Malcolm understood it. It was his specialty," Simpson said. "He seemed somewhat worried about what was going on." He said he wanted LaVergne to argue his appeal but was unable to overrule Galanter. In retrospect, he said, he should have questioned Galanter about many things including his fees that exceeded $500,000. Simpson recalled an early bail hearing at which Galanter advised him "O.J., you have to throw yourself on the mercy of the court. You can't make excuses. You just have to throw yourself on the mercy of the court." — His lawyer advised him he could not be convicted and urged him not to testify in his own defense. He said had he known he could be convicted, he would have testified. — He was never told that Galanter was having preliminary discussions with prosecutors about a potential plea deal that could have limited his prison term to two to five years and perhaps resulted in probation. Prosecutors said Galanter broke off negotiations and they assumed Simpson had turned it down. If he had taken the deal, he would have been out by now. — He met with his lawyer the night before the hotel room confrontation and informed him that he planned to reclaim his possessions from memorabilia dealers. The lawyer said he was within his rights as long as there was no trespass or violence. "It was my stuff. I followed what I thought was the law," the 65-year-old former NFL star and actor said. "My lawyer told me I couldn't break into a guy's room. I didn't break into anybody's room. I didn't try to muscle the guys. The guys had my stuff, even though they claimed they didn't steal it." — He had been drinking all day before the incident but his lawyer never suggested arguing that he was impaired. — Simpson said he neither discussed nor saw any guns during the entire episode. H. Leon Simon, the attorney representing the state, eschewed the fire and brimstone rhetoric of prosecutors in Simpson's trial four and half years ago. He questioned Simpson for a mere half hour, focusing on the strange robbery among friends. Simpson knew the memorabilia dealers trying to peddle his possessions. Simpson did acknowledge under Simon's questioning that he didn't have a legal right to take some things from the Palace Station hotel room that didn't belong to him. Simpson said he thought those items would be returned. He was convicted in 2008 of armed robbery, kidnapping and other charges and sentenced to nine to 33 years in prison. His fall from long-ago fame and fortune was on display as a grayer, bulkier Simpson slowly made his way through the courtroom under guard. The Heisman Trophy college running back and NFL record-setter once made TV commercials running through airports. As Nevada prison inmate No. 1027820, he's been handcuffed and chained at the ankles during the hearing. Simpson's bid for freedom hinges on showing that Galanter had conflicted interests and gave him bad trial and appellate advice. Galanter, of Miami, is due to testify Friday. He has declined comment ahead of that appearance. There is no jury in the hearing and Simpson's fate will be determined by District Judge Linda Marie Bell. It remained unclear whether the judge plans to make an immediate ruling or issue a written order later. 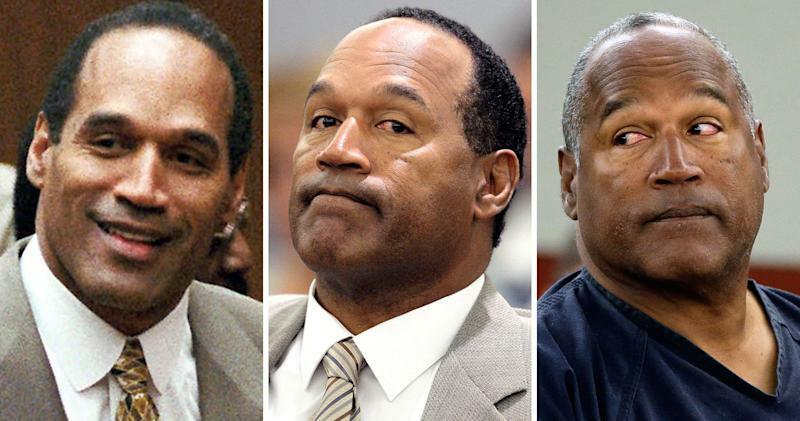 While Simpson's previous court cases were media sensations, including his 1995 acquittal in the Los Angeles killings of his ex-wife and her friend, the Las Vegas hearing drew less attention until Simpson testified and the courtroom was full. Simpson family members and friends filled one row. A marshal turned people away, sending them to an overflow room where video was streamed live.